Having trouble using our client portal? Click here for answers! 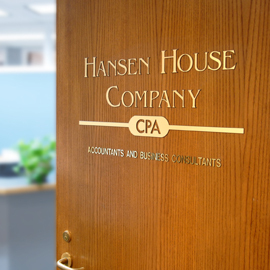 Here at Hansen House Company, we’re more than just individuals who prepare your yearly taxes. We also consult and advise on a number of business services such as accounting systems, financial statements, business valuations, as well as estate and tax planning – to name a few. And at a time when laws are continually changing, we keep up with the changes for both businesses and individuals. Simply put, we understand the need for accurate, responsible accounting. We like to think that we’re part of our clients’ professional team.